The Holon i—c—t and the NOW Operator: i—c—t is a Holon for the NOW Operator. It is Non-Local Teleport Operator. It has an independent exist without the connection to Space. Remember, Space is defined, in this Paradigm, as the component between the Nucleus and the electron Orbits that defines the Atom. 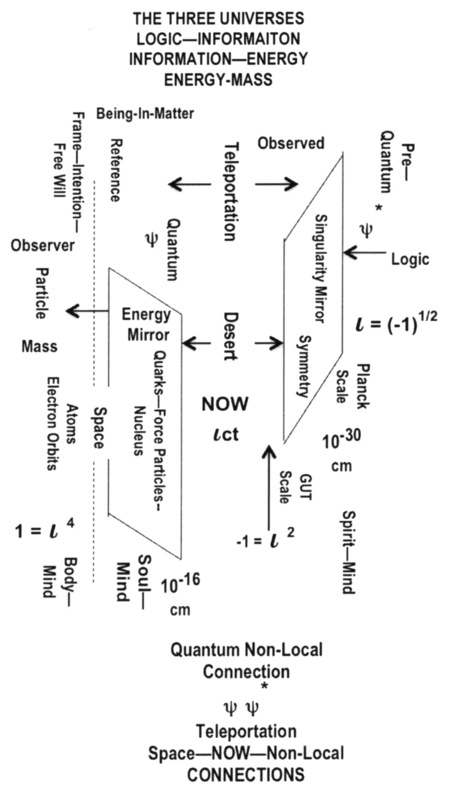 Non-Locality / Entanglement Paradox verse Teleportation: Entanglement, in this Paradigm, is defined as the non-local connections between objects. The connections amongst these “objects” are at will, i.e., they have the ability to Non-Locally Teleport each other. Therefore, there is no Fire-Wall—Entanglement Paradox with the ability in Teleporting at Will. The Quantum and Pre-Quantum Operator: These are the complex wave functions. They come in pairs, one real component and one imaginary component, with the imaginary pair contains opposite signs. They are Quantum and Pre-Quantum imaginary pairs connected together non-locally and serve as Non-Local Teleportation Operators. The Singularity verse Energy Mirrors: The Singularity Mirror is a Base-9 Mirror: while the Energy Mirror is a Base-10 Mirror. Their connecting Reference Point forms a Lock-Key between them. 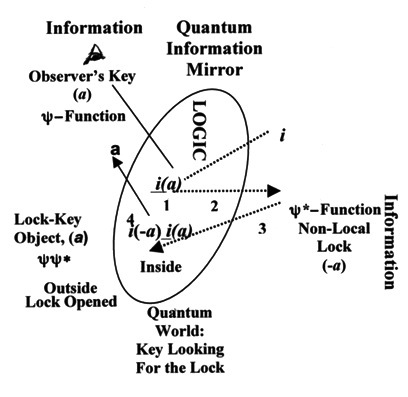 Lock —> Logic, Key àEnergy; while their non-local connections, which is the Binding constant (37/27 —> 137) in Information. The Observer Verse the Observed: In a Lock-Key pair, the Observer is the Key and the Observed is the Lock. 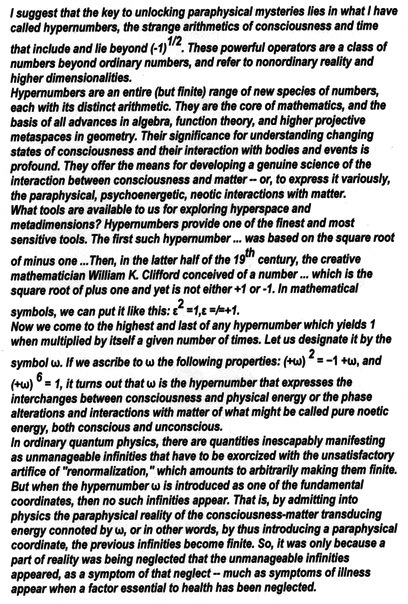 The Holon involves here is Lock—Reference Frame—Key. The Fire Wall protecting the Singularity Mirror: This is the Fire Wall for the Vacuum Computer and not the Fire Wall that protects Entangled Information. 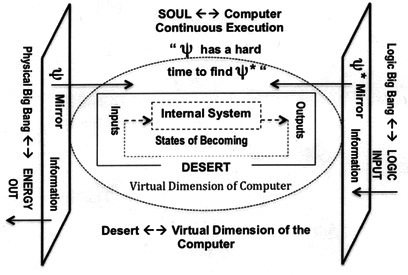 Leave the Reference Frame out of this discussion, most Right Brain Individuals function with their Soul-Mind on the Energy Mirror but have difficulty getting into the Singularity Mirror. They perfectly aware of the Information-Energy Universe with litter understanding of the Information. 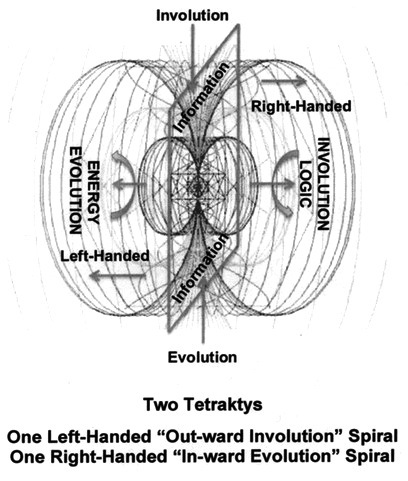 On the other hand the Left-Brain individual, with their intellects, they definitely enter into the Singularity Mirror and understands the Logic-Information Universe, but with no feeling of its Information-Energy. The former has no understanding of where the Energy comes from and its origin. The latter understands the Logic of these Information, yet they created conflicts and attempts to integrates what know through these Mirrors. Both cannot convert what they Sense—Feels—Knows to Complete Knowingness. 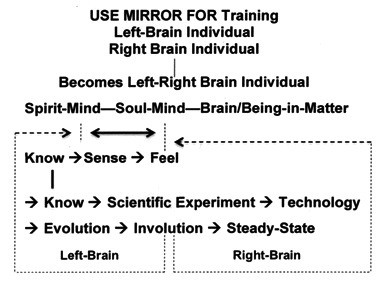 The proper or “correct” Reference Frame comes from both the Left-Right Brain World. They comes from the ancient and the modern worlds. They are Left-Right Brain integrated Reference Frames. 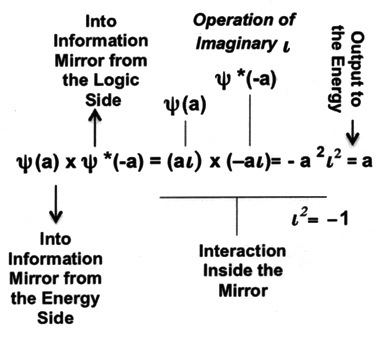 Without the correct Reference Frames, they can inter only one of the two Mirrors. Most of the time without the “correct” Reference Frame to each of the Mirrors, they are them self in conflicts with one another. 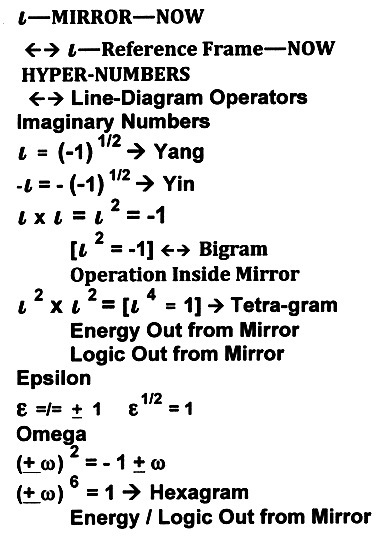 Both Mirrors are connected by Quantum Non-Local (the i connected to their complex Wave Functions) Entanglement and NOW ( connected to its Holon ict). These two Non-Local connections can be treated as another Mirror to form the Holon of Mirrors. Notice the Paradigm in concepts such as imaginary i, space and time, quantum entanglement, and the notions of teleportation. Thus, with this last diagram, the TOE in physics is completed. 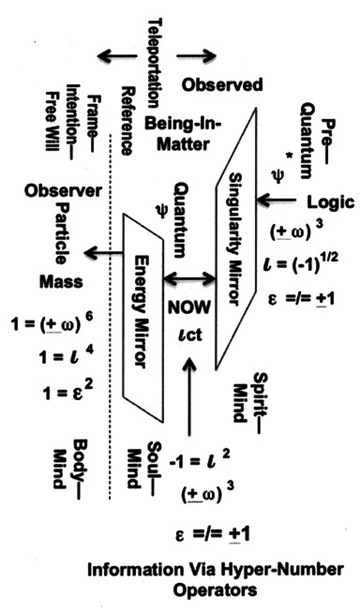 This conclude the concepts on the two Quantum-Information Mirror. What remain for a TOE in physics is the concept of Space and it’s association with NOW, which is topic for the Next Posting.